So the biggest question is what is Gimp and what can it do for my business? In short, Gimp 2.8.22 free download is an image manipulation program and great for screenshots like I have in various places on this website using this exact tool 🙂 Most people want examples and/or proof of the work you may be doing on their behalf and this tool gives you that. Initially it can be quite difficult but once you’ve got to grips with it, it becomes second nature. The black pen also is a good tool to highlight your point. 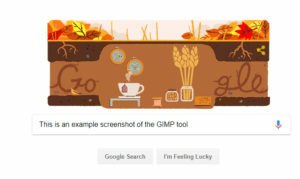 From the above example you can see I’ve taken a screenshot of a normal Google search page and types in the words “This is an example screenshot of the GIMP tool”. I’ve also cut around the page, so that you just see the area required and not the whole page. 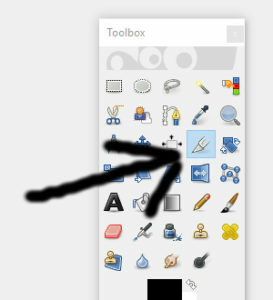 I used the Gimp cropping tool on the right hand side were the arrow’s pointing to and used the black pen for that which is just below the cropping tool on the right hand side of the tools column. These are the only two tools from GIMP that I use on a regular basis, as they give me what I need and I’ve used this excellent free tools for my websites, for my own PDF products and freelancing customers. The only other tool I use to make things look neater is the dotted box. This enables you to highlight a certain area and use the black pen to keep the lines straight both horizontally and vertically for an added look of professionalism. What this will help do for your online business is to give your related work more detail and certainly make a difference in how any of your prospective customer and potential buyers view your site and/or work. For a free download of GIMP 2.8.22 click here. This entry was posted in Services and tagged 2.8.22, download, free, gimp by MDB Marketing. Bookmark the permalink.